Last night (Monday evening) i was invited to a sneak peek tasting of the new "bleeding burger" by Moving Mountains (MovingMountainsFoods.com), the first of it's kind in the UK. Having tried both the Beyond Burger & the Impossible Burger recently in the US, I was keen to see how this one measured up! On arrival, i discussed with one of the founders the story behind the brand and their ambition for it's first product, and was suitably impressed with both their vision and ambition in disrupting the plant-based meat market here in the UK. Sarah-Jane Crawford (@sarahjanecrawford) and I in deep discussion, as per! 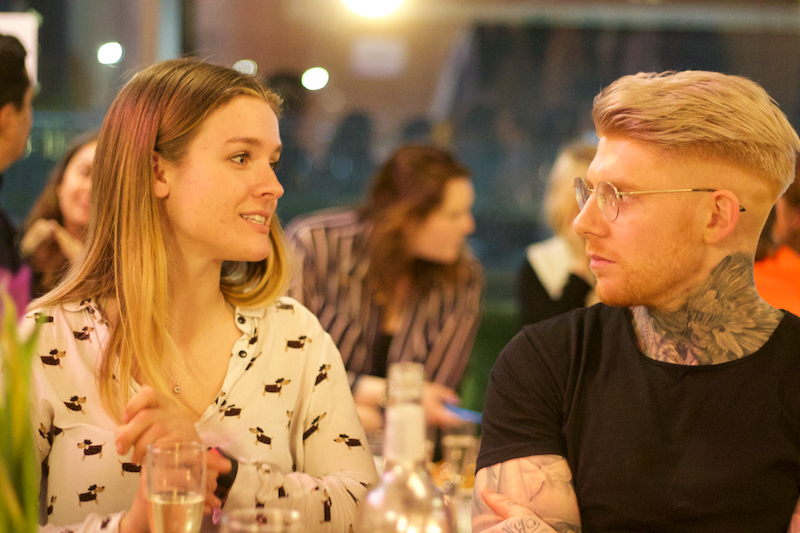 It was good to see some familiar faces, with Gaz (@avantGardeVegan) and Tiago (@TheHealthyBeard) at my end of the table, and Tiffany (Tiffanyc_watson) and Clare (@Thelittlelondonfoodie) as well as some people i hadn't met before. After 30 minutes of eager anticipation, the first burgers were served, alongside chips and Mildred's signature pesto mayo. The burger patty was served in a brioche bun, classic style with lettuce and tomato, sizzling hot and boldly tall with a proud moving mountains flag in the middle. As per any blogger food event, nobody actually ate for the first 5 minutes as everyone clambered for the best photo, but having not eaten since 11am, i was pretty eager to give it a go. I found the patty to be juicy and thick, with a texture akin to how i remember meat, if not a little softer. The burger is made from a number for ingredients for different purposes. Oyster mushrooms to give a succulent texture, beetroot juice to bleed in the middle, coconut oil for a fatty consistency and wheat/soy proteins to offer a fibrous texture. I liked the inclusion of vitamin B12 as a means to genuinely compete with a beef burger, and from a nutritional standpoint perhaps goes beyond (excuse the pun) that of its competitors. Before you eat, take a pic. Taste wise, i liked that it was served with minimal dressing so as to truly allow an experience of the patty, although i can imagine it would be excellent with a vegan cheese and gherkins, or served in a number of other styles. In comparison to the impossible burger, it held together more and was slightly thicker, with a less salty taste. The bleed was realistic, although hid the taste of beetroot quite well. The only criticism i would have is that i can imagine it would be better chargrilled after being cooked, and my personal preference is for it to be slightly more well done, although in direct comparison to the impossible burger, i preferred it. Its great to see a UK company actively position themselves to address the flexitarian market, as this is where i believe the low-hanging fruit (another pun, sorry) exists in convincing people to further reduce their meat intake and support plant-based alternatives. Innovation via competition in this sector will help to create better products and thus remove barriers to entry for those still unconvinced they can truly switch from animal-based products. The brand is presented in such a way that it appeals to meat-eaters and vegans alike, with a clear message of big ambition. The Moving Mountains burger is available in Mildred's Dalston from Saturday 24th February, from 12pm-2pm , on a first come first served basis.